The Eastside Business Association promotes a healthy business environment by providing strategic leadership, support, tools, resources and community involvement for business success. The EBA supports the community through our Kids at Risk Program. Our fundraisers and donations support the Evergreen Hospice Bereavement Counseling for Children, the Kirkland Boys and Girls Club, the KTUB Teen Center and Candlelighters Childhood Cancer Foundation. The Eastside’s strong local economy is characterized by a healthy mix of corporate headquarters, small business, manufacturing and a growing base of high-tech and home-based businesses. A competitive business climate and great quality of life make the Eastside a more than desirable location for both local and world-class enterprises. 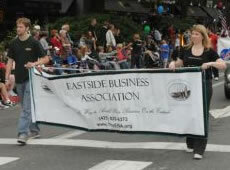 WHY CHOOSE THE EASTSIDE BUSINESS ASSOCIATION? Just like our residents, business owners alike are attracted to the Eastside to live, work and have fun because of its high quality of life amenities. Its waterfront location and natural beauty, cultural and recreational abundance, and small town feel accompanied by big city offerings make the Eastside an enviable address for business to flourish. We know that none of this is likely without a healthy and diverse local economy. Keeping the Eastside Business Community a competitive and good place to do business is a top priority for the EBA.